This treatment will brighten, lift, calm, and infuse essential nutrients for healthier skin no matter what skin type, color, or condition! Each treatment is customized and our formulations bring out your inner beauty by delivering essential building blocks for skin health. A non-invasive treatment that tones, tightens, and lifts sagging skin. MicroCurrent technology re-educates muscles in the face resulting in a more toned and youthful look. We recommend a series of 12 sessions, twice a week for optimum results. A professional resurfacing technique is used to exfoliate dead skin cell layers and for painless hair removal. A sterile surgical blade is used to remove hair and dead skin cells, leaving the skin noticeably softer and glowing. Treatment serums are applied immediately after for maximum benefits. An SPF is applied and recommended for use after treatment to protect the skin. Addresses fine lines, wrinkles and sagging skin using bi-polar radio frequency. Results are best realized with a series of 6 sessions 2 times per week with a maintenance session once every 3 months. Designed for first time clients who have questions and concerns about their skin. We also recommend Level 101 for those seeking a basic results oriented, relaxing facial experience. Treatments are performed using clinical home care strength ingredients. Treatments Include: Surface cleansing, corrective cleansing, Micro Crystal Polish, Level 101 Peel application, extractions, corrective mask, skin specific serum application, eye and lip treatment and protective moisturizer. Designed for clients who are on a regimen of Institut' DERMed Clinical Skin Care products at home and are committed to regular professional facial sessions for enhanced results. Treatments Include: Surface cleansing, corrective cleansing, Micro Crystal Polish, Level 201 Peel application, corrective serum, eye and lip treatment and protective moisturizer. Designed for clients seeking accelerated and rejuvenating results for problematic skin conditions. Treatments are performed using exclusive professional only peels and concentrates to best address individual skin health care needs. 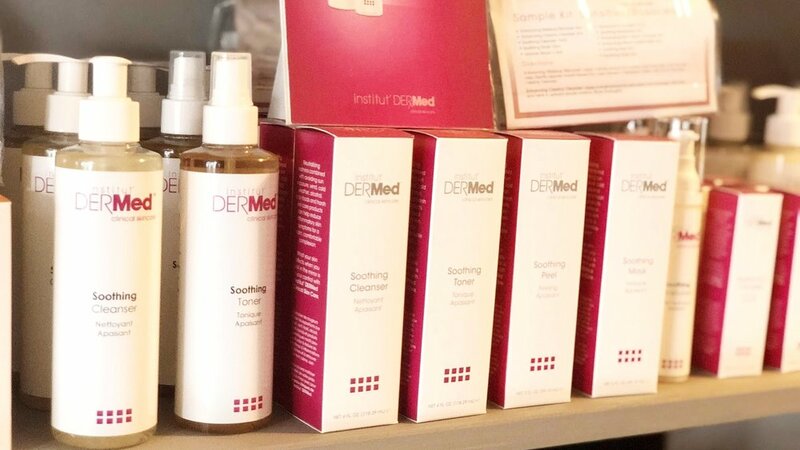 Treatments include: Surface cleansing, corrective cleansing, peel prep solution, Level 301 peel, peptide treatment oil or gel and sun protection. A skin care technology consisting of spraying small crystal on to the skin and removing them by mechanical suction along with dead skin cells. Whether you are looking for a deep cleansing, to even skin tone, decrease oil production, deeply hydrate dry skin, or reduce the appearance of wrinkles and fine lines, this skin care treatment can help. The best part is, there is no downtime and it is effective for all skin types. Love the Skin You're In with Beauty Defined Skincare & MakeUp! A 30 minute consultation. Skin care needs and concerns are addressed. The proper professional treatment and home care regime are recommended. Available in Nourishing Coconut AKA THE KISSER FIXER Need a new and exciting add on? Are your clients too chatty? Need an add-on that won't interfere with other services? Lips by ToGoSpa will give you and your clients that something extra and will promote a zen and peaceful environment. EYES by ToGoSpa provide instant, cooling relief for tired, dry and aging eyes. Beat back dark circles, under eye bags and crow's feet. Rejuvenate from too much sun or too much fun. Party all night - stay out late, still look good and feel great! And as with all ToGoSpa products… No Parabens, No Dyes. Face by ToGoSpa® Collagen Gel Face Masks are suitable for all skin types. Each mask is cut to the shape of the face and ready to use. Activated by the body’s temperature, the nutrients stored in each Face by ToGoSpa® mask are absorbed directly into the dermis. Each face mask provides immediate and visible results to help you look good and feel great! And as with all ToGoSpa products… No Parabens, No Dyes. Add this manual exfoliation on to a facial for maximum benefit from your treatment. This procedure uses light to stimulate collagen and elastin production. Light energy is converted to cell energy and the end result is healthier, stronger skin. Light is used to treat discoloration, scarring, acne and wrinkles.